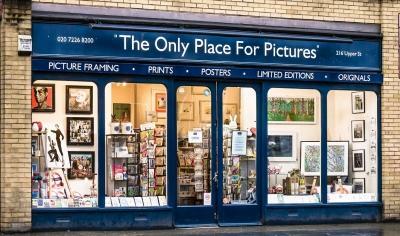 With over 21 years’ experience of framing pictures, we always ensure that they look their best. The picture frame must complement the image, the environment where it’s going to hang, and your pocket! We offer high quality bespoke framing, carried out in our own workshop, at attractive prices. There is an extremely wide range of styles available from: minimalist aluminium to traditional golds and gilts, and natural woods like oak and ash simply waxed; to hand painted frames in pure white, or elegant Farrow and Ball colourways. Over the years, we have framed everything from Ronaldo’s Real Madrid football shirt to Elizabeth Taylor’s shoes. Whilst we enjoy a challenge, we are very happy to frame your child’s school photo, a poster from the exhibition, the canvas from Cuba, or that picture you have always loved, and make them look even more special. We use acid free materials whenever possible, with a wide choice of Arqadia and Bainbridge conservation and museum quality mount boards, to protect the artwork. As well as regular float glass, Perspex, non reflective and U/V protective and the amazing art glass, are also available. For posters and whenever else it’s appropriate, we always like to dry mount images, to ensure that they always look as good as they should. If you need an instant solution for a standard size poster, print, photograph or whatever, we offer a wide range of Nielsen aluminium readymades and high quality wooden frames in black, white or oak finishes which we can normally fit on the spot. 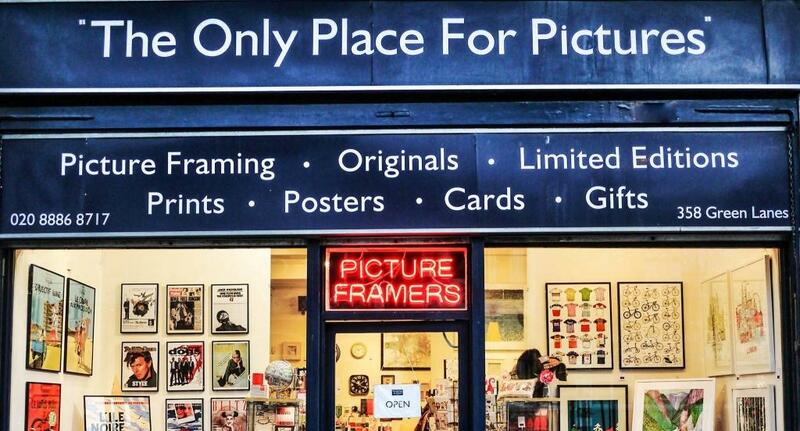 For helpful picture framing advice and guidance, a quote, or just a chat about what’s possible, please visit us, with your artwork, in either Islington or Palmers Green.